Text of an anti-army recruitment leaflet produced by the now-defunct Walthamstow Anarchist Group in 2005, during the Iraq war. If you are under 18 and join the army, you only have the chance to leave between the second and sixth month of service. After that you must serve until you are 22. You must remain in the reserves for another six years. If you go absent without leave you can be detained as punishment. You cannot buy yourself out. At 16, politicians say you are too young to vote, learn to drive, by a point, or get married without your parents' permission. But politicians DO think that you're old enough for them to give you a gun and order you to risk being killed or maimed, or to kill and maim another. Britain is the only country in Europe putting 16-year-olds on active service. The adverts for the army make it look like you can start in your very own high-tech videogame where nobody gets hurt. The reality can be very different, as many currently serving in Iraq have found out. Gordon Gentle was 16 when he joined up and was killed near Basra, Iraq last June. His mother joint Military Families against the War in supporting soldiers who oppose the war. 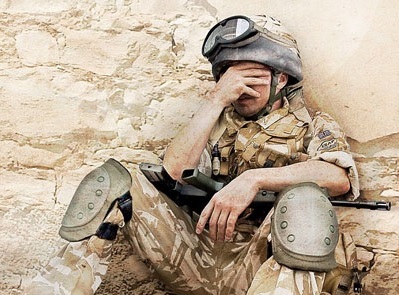 The minimum wage for privates in the British army serving in Iraq in February was £13,000. An independent assessment of the training of recruits, after the deaths of four young recruits at Deepcut barracks in Surrey, found a culture of widespread bullying, sexual harassment and racism, with conditions in some barracks little better than slums. Suicide among young men under the age of 20 in the army is 1.7 times higher than civilians of the same age. And if you come back alive, do they care? Hundreds of British soldiers are expected to be sacked because wounds or injuries suffered in Iraq have left them unfit for front-line service. Up to 2000 veterans have been permanently medically downgraded and many are being assessed for compulsory discharge. Army commanders have admitted that young people have started questioning whether to join the army, because of Iraq. Also, parents are refusing to sign consent forms to sign up junior soldiers. Don't join the army, get out before 6 months if you're in, and your mates too. This leaflet is produced by Walthamstow Anarchist Group. We want to get rid of capitalism and build a society where ordinary people run things, and kick politicians out. If you want to get involved with this or want more information, get in touch with us by [default contact details removed].